Unlike the other projects in this series, the mirror frame design made here is relatively simple, but for those of you who would prefer something that is closer to true Mission style I have included a couple of variants on the plans. The mirror is of a size that should look right above the Mission chest project featured in issue 10, but it would be equally at home anywhere. 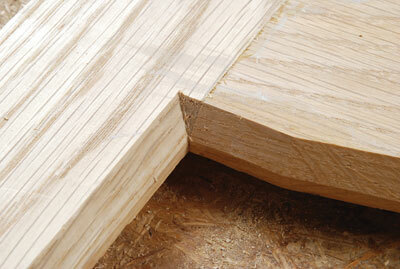 The finished thickness of all components is 25mm apart from the cap rail. 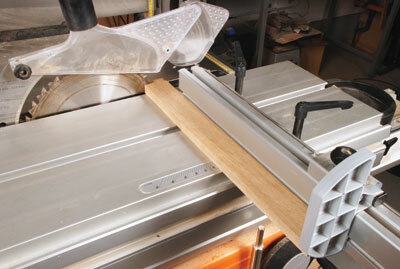 This is not only for appearance but because it also allows enough depth to rebate the mirror and backing panel in place. 1 First, pick what are hopefully some matching boards to make the frame. 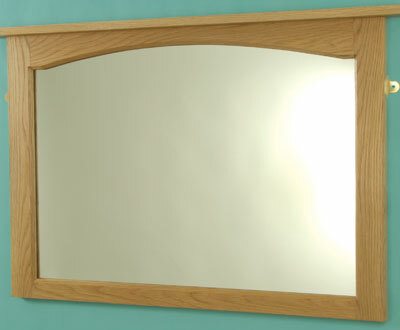 Ideally you need to cut it all out of one board as American white oak can vary a lot in colour and grain from one board to another and on a mirror frame these differences will be noticeable. 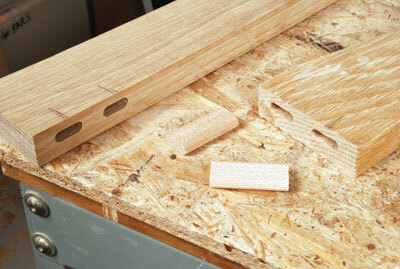 The cap rail can be from a different board as it doesn't lie in the same visual plane. 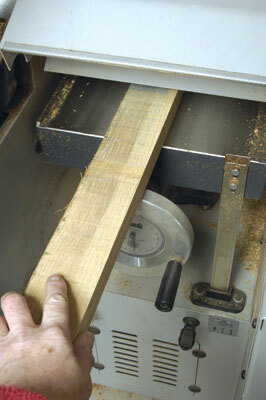 2-3 Do the initial sawing out and overhand planing. Choose the best face to show forward in each case and thickness all components, then cut to finished length in all cases. 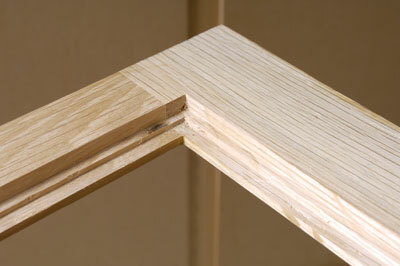 As with the previous projects I have used Domino joints; if you prefer to cut mortise and tenons, add the correct allowances. 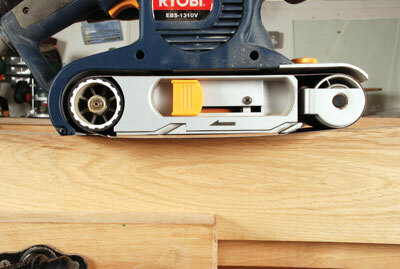 4-5 The frame is quite simple, the top rail being curved to match the curve I have used on previous Mission pieces. Mark this out as previously described using a thin strip of MDF and block to hold the curve while drawing along it, then bandsaw carefully to the line, mount in a vice and belt sand until you get a smooth even curve. 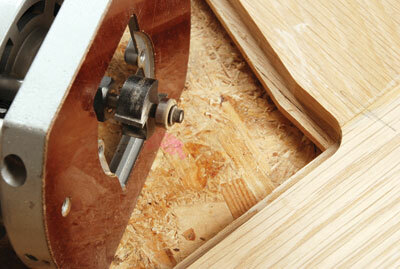 Now for the slightly interesting bit, jointing. This time we need to use smaller Dominos offset towards the front of the frame, thus avoiding the double rebates we will do later. 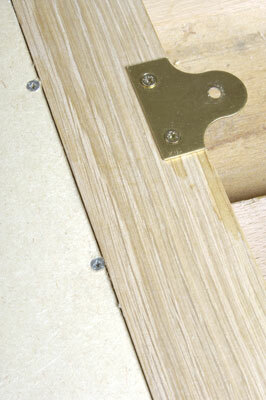 Likewise the joints must not be too close to the inside edge of the frame as this will be bevelled. 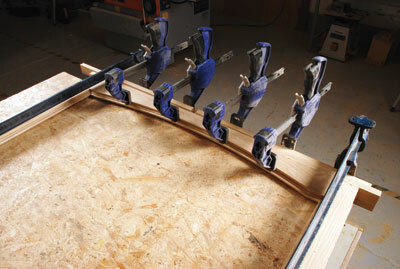 6 Use two Dominos per rail side by side, then glue and assemble. 7 Once the glued frame has set, belt sand across both faces to make them level. 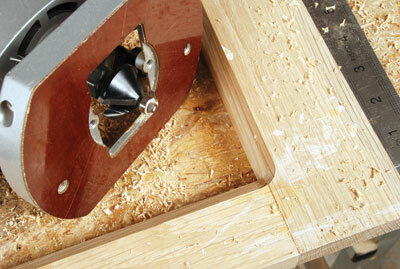 8 Now the front decorative bevel can be machined using a small router and a bearing-guided bevel cutter. Do this in a couple of passes to depth, allowing for a small flat section between the bevel and where the double rebates will be. 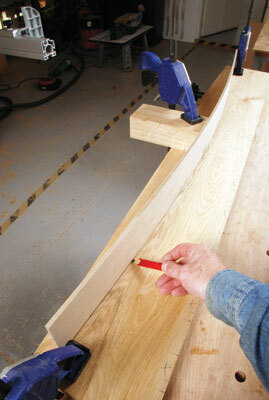 Use a sharp chisel to square out the bevels at the frame corners. Turn the frame over and mark the depths for the two rebates: the first is for 4mm mirror glass and, to hold the mirror in place, the second is for 6mm MDF. 9 There is a problem here: the frame has a curved top and a rebate and groove cutter with bearing will simply follow the curve. That's fine if your glass supplier can also cut a curved edge with a slight straight shoulder at each end to match the frame shape. To avoid having to make a template for the glazier to work to, I ducked this one and belatedly decided to machine quite a bit away on the top rail so it was square and therefore easy to drop a rectangular mirror straight into it. So, three edges are done with a combination of two different bearing-guided cutters, one a rebater, the other a 6mm groover, while the top edge is done very carefully with a router and fence running along the outer edge of the top rail. Needless to say, care is required to avoid accidentally digging into the outermost area of the rail; it won't be seen but it's nice if you don't spoil your own efforts! 10-11 Square the corners of the rebates and get the mirror cut to size, taking the frame along so the fit can be checked on the spot. 12 The cap rail needs to be biscuited on flush with the back edge. As it is 20mm thick, No.20 biscuits should be safe to use without 'show through'. 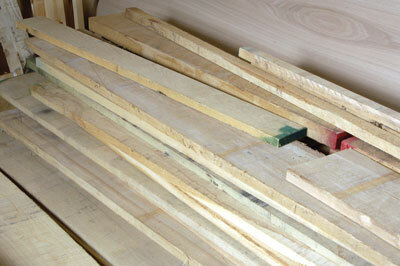 Wait to glue up after everything has been thoroughly sanded. 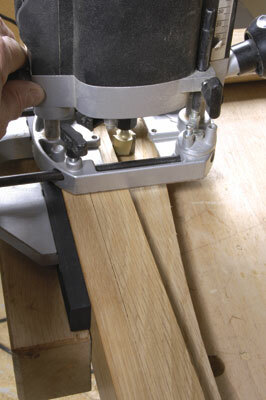 13 Hand sanding will be required on the bevels and the arrisses must be broken of course. Now glue the cap rail on, cramp and leave to set. Apply sanding sealer, flat off and wax, then install the mirror glass and the MDF backing board. 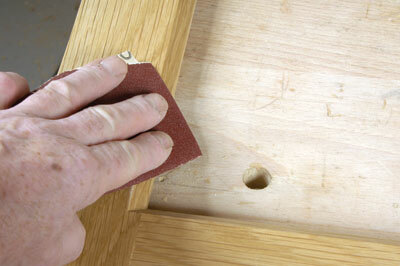 Use small screws to fix it on, taking care to avoid the glass hidden underneath. 14 To fix to a wall the time-honoured mirror plates are probably your safest option. "The top rail is curved to match the curve I have used on previous Mission pieces"